2 TOY TRUCKS FOR HEAVY HAULIN' CREATIVE FUN – The front loader and excavator toy construction vehicles include lots of fun ways to get creative with non-toxic Play-Doh compound! Kids will really dig these rigs – it's the next best thing to playing in real dirt! FEATURING PLAY-DOH SAND BUILDIN' COMPOUND PLUS 2 COLOURS –This construction set comes with 2 ounces of Play-Doh Sand Buildin' Compound – it's just like the quality Play-Doh compound we all know and love with specks mixed in to look like sand! ROCK OUT WITH THE EXCAVATOR – Shape the Play-Doh Sand compound into rocks with the mould inside the excavator's shovel, then let the rocks drop and crash! SCOOP AND SCULPT WITH THE FRONT LOADER - Press Play-Doh compound through the front loader’s bucket to create building beams and logs! Both trucks can also roll tire tracks into Play-Doh compound for more rough 'n rumble fun! 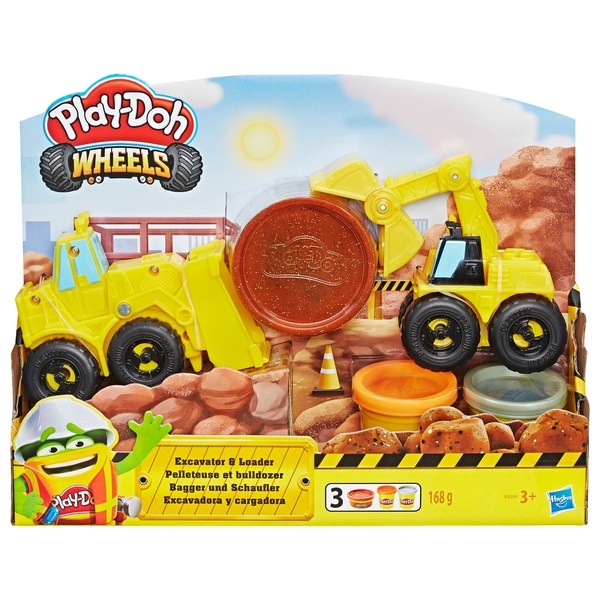 BUILD YOUR OWN CONSTRUCTION ZONE – Play-Doh Wheels sets feature construction truck toys with a creative Play-Doh twist! Truck-loving little ones who enjoy arts and crafts activities with modelling clay will be revved-up and ready to roll with two of their favourite ways to play in one! Includes: excavator, front end loader, 1 can of Play-Doh Buildin' Compound and 2 cans of Play-Doh Brand Modelling Compound. No expiry date! Build and bash, heave and haul – imagination does it all! This construction toy for kids ages 3 and up makes it even more fun to get creative. These 2 mighty front-end loader and excavator toy trucks feature their own giggle-worthy ways to shape and create all kinds of construction-themed shapes like rocks, hard hats, and shovels. The 3 non-toxic Play-Doh colours each come in 2-ounce cans, and one of them contains awesome Play-Doh Sand Buildin' Compound. It's just like the squishy Play-Doh compound we all know and love but with gritty specks mixed in to look like sand. This and other Play-Doh Wheels toys make the perfect gift for truck-loving preschoolers to get them engaged in creative activities with Play-Doh compound! Other Play-Doh Wheels playsets sold separately. To clean, allow to dry, then scrape or vacuum. Moulded results vary depending on child’s age and level of skill. EU Warning: Not suitable for children under the age of 3 years due to small parts which could cause a choking hazard. Compound not intended to be eaten. Notice to Parents: Contains Wheat. Non-Toxic. Conforms to: ASTM D-4236.